The obscure iconography of Dosso's canvas has caused much speculation. In the past it has been titled simply Scene from a Legend and, more often, Departure of the Argonauts. The present title refers instead to an event in Virgil's Aeneid. Designed to celebrate the origin and growth of the Roman Empire, the Aeneid tells the story of Aeneas, who after the fall of Troy and seven years wandering, founded a settlement on the Italian peninsula, establishing the Roman state. The story of Aeneas and Achates is taken from Book I of the Aeneid, where Aeneas and his faithful companion Achates, their journey just begun, take refuge on the Libyan coast after their ships are wrecked in a storm. 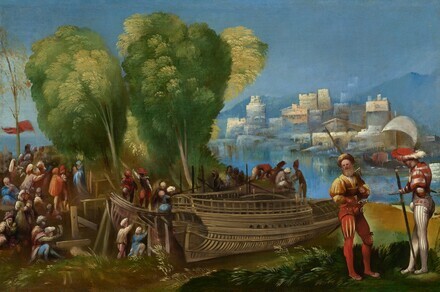 Two other surviving scenes from the Aeneid by Dosso have been located, one in England, the other in Canada, and along with the Washington canvas have been identified as part of a frieze of ten pictures painted by the artist for the camerino, or study of Alfonso d'Este in his castle at Ferrara. Dosso Dossi was greatly influenced by Venetian art, especially the use of color and treatment of landscape as seen in works by Titian and Giorgione. He was perhaps best known in his time for soft, feathery landscapes and scenes of everyday life that are nevertheless infused with a touch of fantasy. Commissioned by Alfonso I d'Este, Duke of Ferrara, Castello, Ferrara, by c. 1521; by inheritance through the Este Collection, in Camerino d'Alabastro, until 1608; Borghese collection, Rome, until at least 1693. (Kunsthandel A.G., Lucerne); sold 1926 to (Julius Böhler, Munich and Luzerne). (Count Alessandro Contini-Bonacossi [1878-1955], Florence and Rome, from the early 1920s); sold 1936 to the Samuel H. Kress Foundation, New York; gift 1939 to NGA. Pitture Ferrarese del Rinascimento, Ferrara, 1933, no. 198, repro. Masterpieces of Art. European Paintings and Sculpture from 1300-1800, New York World's Fair, 1939, no. 83, as Departure of the Argonauts, repro. Obras Maestras de la National Gallery of Art de Washington, Museo Nacional de Antropología, Mexico City, 1996-1997, unnumbered catalogue, 58-59, color repro. Dosso Dossi: Court Painter in Renaissance Ferrara, Exhibit Halls, Palazzo dei Diamanti, Ferrara; The Metropolitan Museum of Art, New York; The J. Paul Getty Museum, Los Angeles, 1998-1999, no. 19, repro. Preliminary Catalogue of Paintings and Sculpture. National Gallery of Art, Washington, 1941: 58, no. 361, as Scene from a Legend. Book of Illustrations. National Gallery of Art, Washington, 1942: 246, repro., as Scene from a Legend. Paintings and Sculpture from the Samuel H. Kress Collection. National Gallery of Art, Washington, 1959: 169, repro., as Scene from a Legend. Summary Catalogue of European Paintings and Sculpture. National Gallery of Art, Washington, 1965: 43, as Scene from a Legend. European Paintings and Sculpture, Illustrations. National Gallery of Art, Washington, 1968: 36, repro., as Scene from a Legend. Shapley, Fern Rusk. Paintings from the Samuel H. Kress Collection: Italian Schools, XV-XVI Century. London, 1968: 73-74, fig. 183. Shapley, Fern Rusk. Catalogue of the Italian Paintings. 2 vols. National Gallery of Art, Washington, 1979: I:164-166, II:pl. 115. Bull, David. "Introduction." Studies in the History of Art 40 (1990): 11, 15, repro. no. 8. National Gallery of Art. National Gallery of Art, Washington. New York, 1992: 33, repro. "Vasari and the National Gallery of Art." National Gallery of Art Bulletin 48 (Spring 2013): 20, repro.